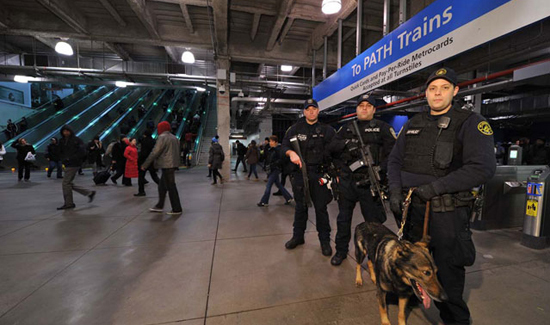 Officers with the Special Operations Division of the Port Authority of New York and New Jersey Police Department. Two New York and New Jersey Port Authority officers have filed a joint lawsuit in Manhattan Federal Court claiming their employer discriminated against them because of their backgrounds. One of the cops is Jewish and the other is Iraqi. Port Authority Officers Oren Hindi, 43, a Jewish man of Israeli and Yemeni descent, and Maysam Aljader, 39, who is of Iraqi heritage, say they were illegally passed over for promotion to sergeant in favor of less-qualified candidates. Hindi says that co-workers referred to Plainview, LI, as “Plainjew” after he moved there, and that when the name of a Jewish PAPD inspector came up, they told him, “Hitler should have finished the job.” “It’s very true that racism makes for strange bedfellows,” said the duo’s Queens-based lawyer, Thomas Ricotta.